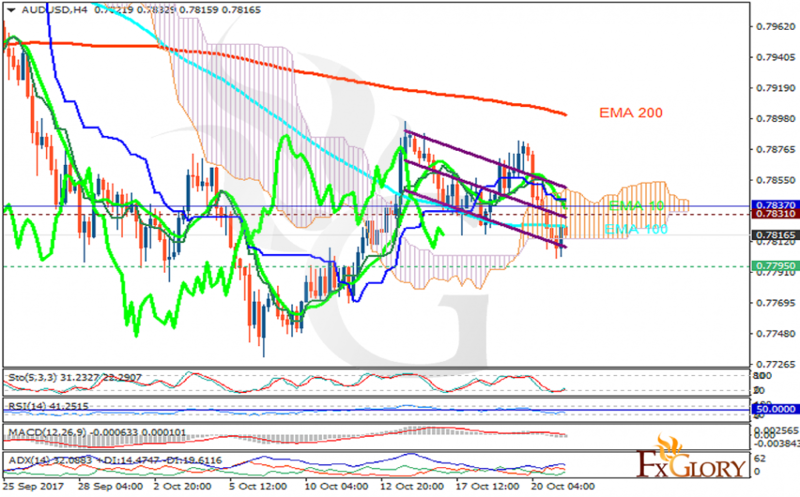 As a result of divergence in monetary policy between the Reserve Bank of Australia and the U.S. Federal Reserve, AUDUSD has been moving with bearish bias. The support rests at 0.77950 with resistance at 0.78310 which both lines are below the weekly pivot point at 0.78370. The EMA of 10 is moving with bearish bias along the descendant channel and it is below the EMA of 200 and above the EMA of 100. The RSI is falling towards the oversold area, the MACD indicator is in neutral territory and the Stochastic is moving in low ranges. The ADX is not showing any clear signals. The price is below the Ichimoku Cloud and the Chinkou Span. The Tenkan-sen and the Kijun-sen are both showing a horizontal trend. Short positions are recommended towards 0.7740.